James Gamble Rogers was one of Florida's preeminent architects of the early 20th century. Practicing in Winter Park, his most notable works were wonderful Central Florida homes built mainly in the 1930s & 40s and commercial structures including the Florida Supreme Court Building in Tallahassee and various buildings on the Rollins College Campus. 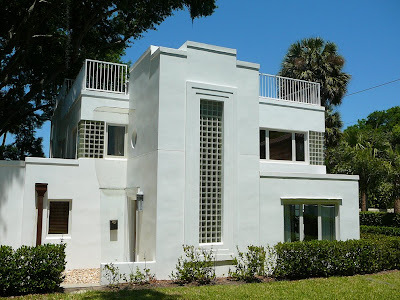 I attended the 2009 James Gamble Rogers II Colloquium in Winter Park and was excited to learn more about this talented Floridian and the fabulous homes that are his legacy. 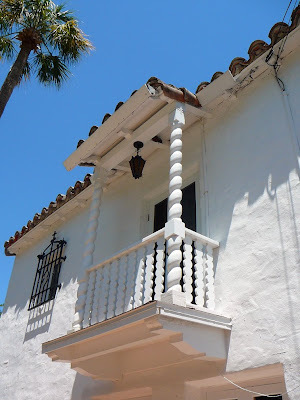 The Spanish Revival or Mediterranean Style sprang from Florida's history as a Spanish colony and the desire of northern residents to have exotic homes in Florida completely different from their homes up north. Many of JGR2's signature home's are in this style, including Casa Feliz and this home, the Holt House, originally built in 1939 and expanded in 1941. Despite the lengthy appearance of this home, I found the scale of JGR2's houses to be very livable. Unlike the Mediterranean Revival homes of Addison Mizner in Palm Beach, Roger's homes were designed to be lived in, rather than just winter play places for the rich. The Shippen House was JGR2's first "eclectic" Spanish house and incorporated many design elements that became signature elements including a central courtyard, barrel tile roofs, hanging balconies, a turret and a semi circular staircase. This 1937 Art Moderne masterpiece, the Jewett House, is located next door to the Shippen House. Originally set in an orange grove it was nicknamed "Treetops" for the exterior rooftop balconies at tree level. 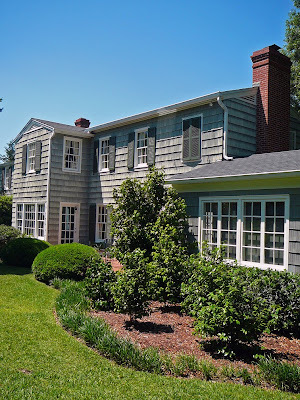 The final house on the tour was this Cape Cod-esque, shake-shingle style house. Most of this house was just one room wide so that the lake breeze could blow easily through when the windows were opened on both sides. Today it is immaculately decorated with furnishings appropriate to the design of the house and resembles a museum in it's themed perfection. Another signature of JGR2 was intentionally aging his houses. He even sagged the roof line to gve the appearance of old age as evident in this house in Orlando. 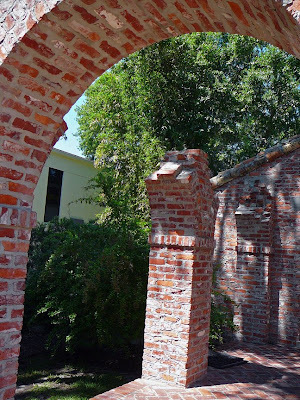 At Casa Feliz he deliberately created a broken arch to create an old world look. 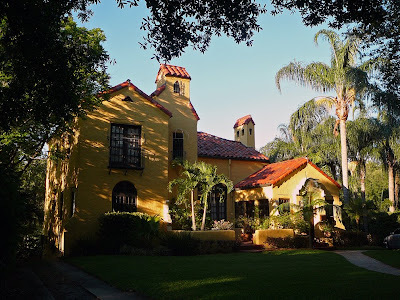 Two other things about Casa Feliz, JGR2's masterwork that was saved from demolition by being moved to a new location at the end of Winter Park's famed Park Avenue. First it is now run as a rental facility by JGR2's grand daughter, Betsy Miller. Her father, Jack Rogers, also an architect, provided much of the information about his father and the Holt house. The second interesting piece of information is that after the owners of Casa Feliz threatened to tear the home down, prompting the move to a new location, an eagle's nest was found on the site making it difficult to build on due to environmental regulations. So ironically enough, the the original lakefront site of one of James Gamble Rogers II's greatest homes is now a vacant lot. Agreed- photos do not do them justice! Good stuff Rick. The Jewett House looks amazing! Wish you could add more pictures. Love his work. He also did homes that looked like they were right out of the northeast. Like the one at 160 glenridge, winter park,fl. 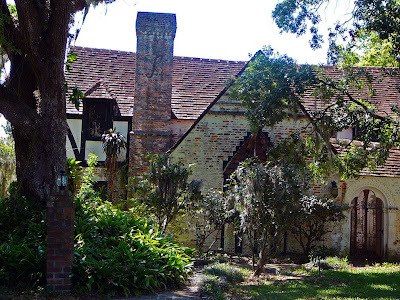 There is a Gamble Rogers house at 851 Georgia Ave. in Olde Winter Park that I never see on lists, even though it has been documented by Gamble Roger's son and relatives as having been designed and built by him. Jim H.
Surreal stuffed animals or taxidermy treasures?